The North-Hessian public transport union (NVV) is using an innovative concept to make a virtue out of necessity and hope that car owners will lend their support. The idea is to complement public transport services like buses and trains in rural areas by adding private car sharing options. These are meant to create transport possibilities where operating public transport services has become less economically lucrative. This unique model project will soon launch an intense search for car owners and drivers who would like to offer rides in their vehicles via the NVV. 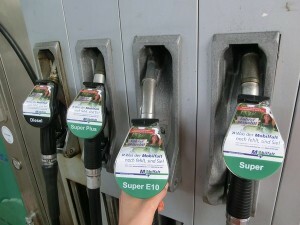 Fitting the motto “Mobilfalt” − the official name of the project, combining the German words for mobility (Mobilität) and diversity (Vielfalt) − unusual personal ads will be used on FillBoards™ (ads on petrol pump nozzles) at selected north-Hessian service stations from August through September. 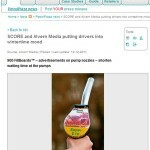 Ambient specialist Alvern Media employs this mode of advertisement and hopes to additionally attract potential partners with an exciting promotional competition. Drivers who register and are willing to offer rides can win a navigation system for their cars. Private car rides will be integrated into both the public transport fee and scheduling structures in the pilot regions of Sontra, Nentershausen, Herleshausen as well as Witzenhausen (Werra-Meissner district) and Niedenstein (Schwalm-Eder district). Despite intensive preliminary work for the project and having received support by the Hessian State Government, the ‚Mobilfalt‘ instigators find themselves faced with the challenge of acquiring and convincing non-commercial drivers to participate. This small but effective ambient campaign at petrol stations in the area will effectively provide information to the corresponding volunteers who will provide help and advice to the citizens in the coming weeks. Everyone can join in and offer regularly scheduled or single rides in privately owned cars to others. They will receive a subsidy of 30 cents per kilometre for the service. Up to now during the pilot phase, the passenger price for a ride has been calculated at one euro. 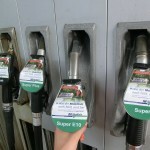 Alvern has been an established provider of innovative advertising at petrol stations since 1997. Alvern Media GmbH has patented the Fillboard™ advertisements on petrol pumps as an outdoor medium in 43 countries all across Europe. Moreover, they introduced DoorMedia™ (door graphics) in Germany. Alvern has a portfolio of more than 240,000 advertisement spaces on the German and Austrian markets; this number increases to 560,000 when counting the total number of advertising spaces in all of Europe. 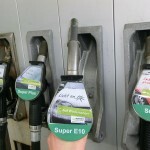 More than 9,500 German petrol stations have been supplied with FillBoards™. This equals 76 percent of the pump volume. 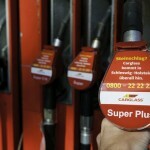 Also, approximately 2,000 stations operated by different oil companies can be supplied with DoorMedia™. The material on this site is provided for editorial use only.